Last week was a horrible week, first with the shooting at a local mall in Oregon, then the shooting at Sandy Hook Elementary School in Connecticut. Yet, for me, it was followed by a precious weekend with my grandkids. Over the last few days, the news has been full of details about the shootings and those with something to say about them, yet often nothing of value was added to the news. I’ve heard politicians and commentators blame this or that. We’ve heard much about the expected proposal of restricting ownership of guns. The reality is the young men who committed these shootings were either mentally disturbed or consumed with evil. I will not attempt to understand them, make excuses for them, or otherwise try to remove any of the blame from them for what they have done. For whatever reason, they chose to kill others. American society has a problem. Mental illness is a problem that needs to be addressed, and evil must be confronted and opposed. I wonder how many of those young people who have committed heinous crimes over the past decade did so to be famous. How many let anger or hatred mix with loneliness and insecurity to fill them with the evil or sickness that led to horrendous acts. Today, how many people walk among us who have no connection with the people in their community? The decline of churches and civic organizations has not improved our communities or society. We must find ways of connecting people once again. Our nation’s history is one of independent people who band together in common cause. The last 40 years have been ones where we haven’t been as good at banding together. It is time to change that. When I grew up, I knew everyone in the community looked out for the young people. There were expectations and we tried to live up to them. We made mistakes and learned from them. Even when we were filled with thoughts that no one understood us, we knew others cared about us because we were connected. The Grange is an organization to connect to people and as a national family organization, we comfort each other in times of tragedy and cheer together at times of joy. We grieve with the families and community in Connecticut whose loss is so great. Our State Grange in Connecticut has established a relief fund for the Newtown community, and I encourage every member who desires to contribute to the fund to do so. 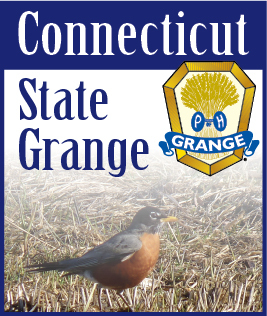 To learn more, click here (http://www.ctstategrange.org/showarticle.asp?id=4084). The families of the victims need our support, both financial and moral. I also ask that each Grange recommit to reaching out in your community to build connections between people. The government cannot do this, only concerned people in your community can make such efforts possible. Let us remember that especially in this season, we must reflect upon the blessings and joys, not the tragedies and horrors. We must join together to help those affected by these senseless acts while doing our part to bring young and old together. In this way we may do our part to prevent a future repetition of these acts in our community.